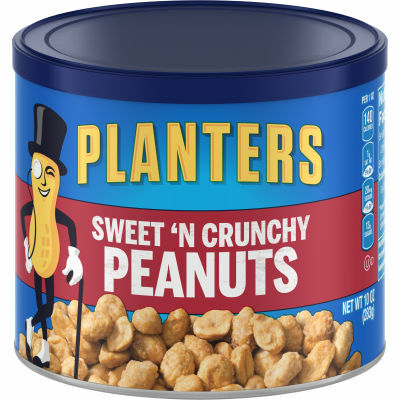 Sweet N' Crunchy Peanuts - Sweetened with sugar and buttered and dusted with sea salt, Planters Sweet N' Crunchy Peanuts tasty peanuts offers a sweet, nutty flavor that includes significant amounts of protein, iron, and fiber. Satisfy your crunchy cravings and fuel up when you are running on empty with this delicious, sweet-and-salty snack. - A Satisfying, Crunchy Snack - These peanuts are rich in nutrients and a satisfying treat for anyone who enjoys munching on crunchy snacks loaded with flavor. They are perfect for between-meal snacks, as part of your brown bag lunch, or paired with ice cream as a tasty dessert. Keep them on hand at work and at home for on-the-go snacking. This package contains one 10 oz canister. Serving size 1 oz (28g/about 40 pieces).